Put the chopped chocolate and butter in a heatproof bowl and set aside. Put the cream and sugar in a saucepan set over a gentle heat, stirring constantly until the sugar has dissolved. Increase the heat and once it just comes to the boil, turn off the heat and leave it to cool for 1 minute before pouring over the chocolate. Mix with a spatula until the chocolate melts and you are left with a smooth ganache. Whisk in the whisky, a little at a time. Leave the ganache to set at room temperature for a few hours. Sift the cocoa and set aside. 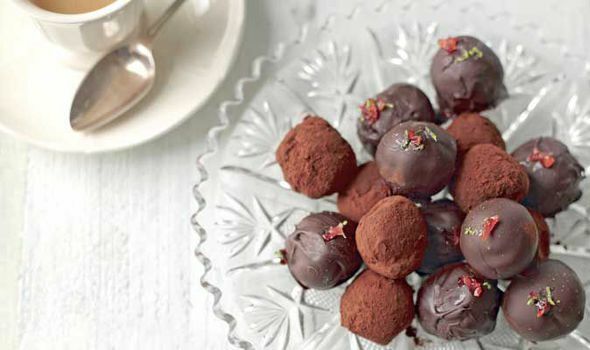 Once firm, scoop teaspoonfuls of the ganache and roll into balls. Roll them in cocoa, shake off the excess and decorate with candied fruit if desired. Stir in the sugar and add 150ml of water in a saucepan set over a gentle heat until the sugar has dissolved. Increase the heat and leave to boil for a minute or so. Add the finely sliced chillies and reduce the heat, before leaving to simmer very gently for 25 minutes. Turn off the heat and leave the chilli syrup to cool. Once cool, cover the top of the pan with clingfilm and leave to infuse and soak for at least 10 hours. You can make these up to 3 days before using. Dip the truffles in the tempered chocolate, until evenly coated, and place on a piece of baking parchment. Decorate with a little candied chilli and lime zest and leave to set at room temperature for about 30 minutes before serving. First, make the joconde. Whisk the eggs, egg yolks and icing sugar together until pale and fluffy. Add the ground hazelnuts and continue whisking for about 5 minutes. Stir in the melted butter and flour until thoroughly mixed. In a separate, clean and oil-free bowl, whisk the egg whites and salt until stiff, but not dry. Whisk in the caster sugar in two stages and continue whisking until the meringue is stiff and glossy. Add a third of the meringue to the nut mixture and vigorously stir in to slacken the batter. Fold in the remaining meringue and pour the mixture into the prepared cake pans. Use a palette knife to smooth the mixture out thinly. Bake in the preheated oven for 8-12 minutes, or until the joconde is no longer sticky to touch. Keep a close eye on it, as it can burn very quickly. Remove it from the oven and leave to cool in its pan on top of a wire rack for about 10 minutes before turning onto the rack to cool completely. To make the French buttercream, put the sugar and 2 tablespoons of water in a pan set over a gentle heat and stir until the sugar has dissolved. Increase the heat slightly and simmer until it reaches the soft ball stage – this happens at around 113°C (235°F). Put the whisked egg yolks in a large mixing bowl and trickle the hot syrup in, whisking all the time. Once pale and fluffy, leave the mixture to cool a little before whisking in the butter. Whisk in the liqueur and leave to cool completely. Fold in the praline and set aside. To make the ganache, heat the cream to just boiling point in a saucepan set over a gentle heat. Pour the hot cream over the chocolate in a heatproof bowl and mix with a spatula until smooth, thick and glossy. Whisk in the butter and leave to cool. To assemble, trim both the sheets of joconde into rectangles, cut each rectangle in half so that you have 4 pieces of cake. Turn one piece of joconde over and paint it with the tempered chocolate. Set at room temperature before turning it over. Apply a liberal amount of the sweet espresso to the top to turn the cake brown. Evenly spread a layer of buttercream about 5mm thick over the espresso-soaked sponge and place another layer of joconde on top. Soak the cake in hazelnut liqueur this time. Spread a thin layer of ganache on top and set at room temperature. 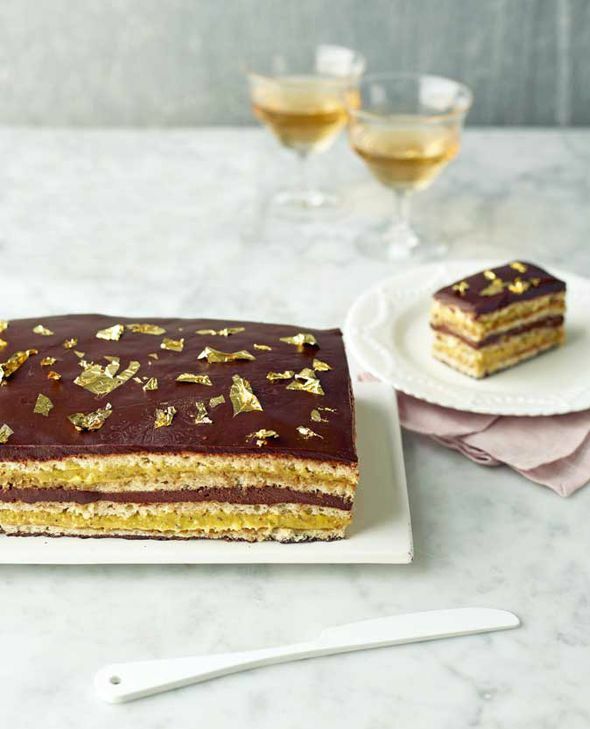 Repeat this layering, set, then sprinkle with gold leaf to serve. 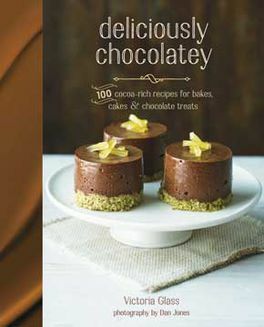 Recipes taken from Deliciously Chocolatey by Victoria Glass (£16.99, Ryland Peters & Small), photographs by Dan Jones. To order your copy, call the Express Bookshop on 01872 562310, send a cheque or postal order made payable to The Express Bookshop to Express Bookshop, PO Box 200, Falmouth, Cornwall TR11 4WJ, or order at expressbookshop.com.